When most people think of popcorn the image of a movie theater lobby comes to mind. The aroma of popcorn and melted butter is ingrained in our memories. Yet Washington Park offers a new thought. The Red Popcorn Wagon of Sandusky has a permanent home here in Washington Park. This particular wagon, identified by its serial number, was originally purchased on June 2, 1906 by Iacgele & Dinning Co., Millersburg, Ohio. It is the No. 2 Improved and the purchase price was $200.00. The Red Wagon has been a Sandusky landmark in Washington Park and around the city since 1910 and was entered in the National Register of Historic Places by the National Park Service in 1982. 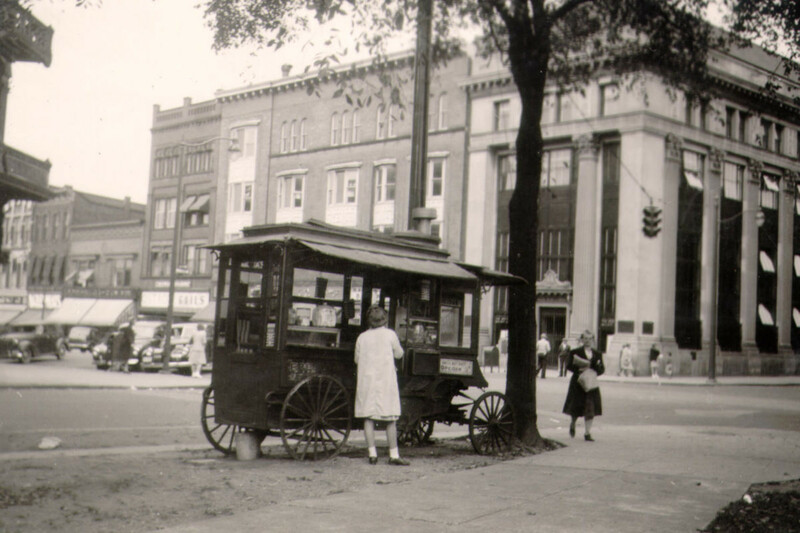 The Colvin family owned and operated the Red Popcorn Wagon for many years before donating it to the City of Sandusky in 2002. John P. ‘Jack’ Colvin died on Aug. 19, 2017 at age 82 he was a former city commissioner. The corners of the wagon roof are cut metal. The colors are bright red and yellow. The wood wheels are on the original axles. Charles Cretors of Chicago manufactured the wagon. He was the inventor of commercial peanut roasters and corn poppers. 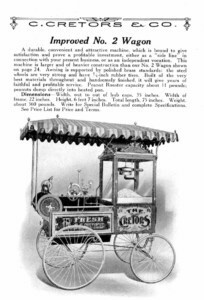 By 1900, Cretors introduced the Special – the first large horse drawn popcorn wagon. It was an immediate success. Three variations of this wagon were created and for the first time in 15 years, C. Cretors and Company showed a nice profit. The machines were, for the most part, still nearly custom made, holding to the Cretors tradition – meeting the specific needs of specific customers. This was also the time period that electricity was becoming the wave of the future. Charles Cretors created the first popcorn machine with an electric motor. Today, member agencies of the United Way of Erie County sell popcorn from the cart to raise money. The groups get 80 percent of the proceeds, while 20 percent goes to an endowment to earn money for future maintenance of the wagon. Did you know the only popping corn that the Red Popcorn Wagon uses comes from the Schlessman Seed Company, a local business? 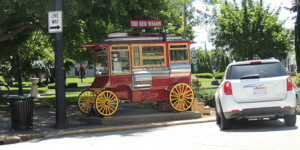 The Red Popcorn Wagon has become a much-loved symbol of Sandusky and has been featured in many works by local artists. Stop and enjoy the beauty of the wagon and get some popcorn! Want to know more? Visit the Red Popcorn Wagon on Facebook.